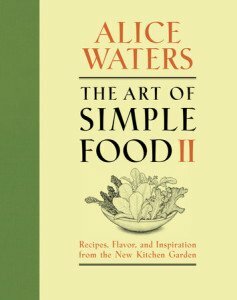 Alice Waters hardly needs any introduction. 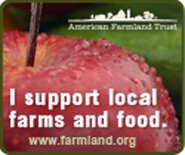 For decades she has championed the cause of the organic food movement, strongly believing it is better for the environment and people’s health. A proponent of a food economy that is “good, clean and fair,” she has been in the forefront of the Slow Food Movement and since 2002 has served as Vice President of Slow Food International. Her numerous books, the Chez Panisse Foundation (established by Waters in 1996 to celebrate the 25th anniversary of her Berkeley, California Chez Panisse Restaurant, the pioneer of farm to table dining) and which became the inspirational Edible Schoolyard Project in 2011, and vigorous public advocacy over 40+ years has earned Alice Waters recognition as an authority on the good food movement. Her most recent book carries on this praiseworthy life’s work. In The Art of Simple Food II (Clarkson/Potter, New York, 2013), Waters focuses on the rewards to be obtained from growing one’s own food. The book is subtitled Recipes, Flavor and Inspiration from the New Kitchen Garden and indeed is as much a paean to the satisfaction to be gained from growing one’s own food as to the pleasure of cooking it. Not only does fresh, organically grown produce taste better, but as any gardener will attest, there is also the deep satisfaction that comes from planting, nurturing and harvesting it oneself. But the reader need not fear the prospect of being burdened with the responsibility of saving the planet: Waters delivers her message in an engagingly simple and down-to-earth way. Nor does she suggest that a large kitchen garden, brimming with a sumptuous array of vegetables and fruits, is required. Many of the vegetables, herbs and fruits that she writes about can be cultivated in small areas or in containers such as window boxes or planters. True to the promise of simplicity inherent in the book’s title, Waters eschews complexity and instead relies on the satisfaction that she has obtained from fresh ingredients prepared in a straightforward way. It’s hard not to warm to a serious cookbook that salutes the grilled cheese sandwich and includes a hint to enliven it (add a couple of sage leaves). The book also contains many personal touches: Waters considers garlic such an essential ingredient that she carries with her a head of it whenever she travels! An account of her personal discovery of the lowly lettuce reveals the huge potential of so many varieties and makes you want to dash out and get hold of as many as possible. Simple tips on growing abound, from the perfect time to plant turnips (early spring or late fall to ensure tender sweetness) to pinching back flower buds and bolting tips of leafy herbs such as basil and anise hyssop to prolong life and increase yield. Issues such as soil quality and enhancement, placement of particular plants relative to sun and shade, mulching, pruning and the timing of planting and harvesting are covered extensively. Nor are aesthetics ignored: there are notes on herbs or fruits that catch the eye in the garden due to their flowers or foliage (and those that attract butterflies) and suggestions for plant placements that complement each other. And as one would expect from Alice Waters, the recipes are wonderful. There are nearly 200. They cover a full range of dishes from soups and salads, pickles and conserves, stews and roasts, to tarts, desserts and even liqueurs. They feature vegetables and fruits as mainstays as well as complements to meat, fish and fowl. None of the recipes are elaborate but, true to the promise of the book’s title, they epitomize the art of simple food. The book contains a helpful “tools and resources” section that includes practical information about essential garden tools as well as seed catalogs, websites and newsletters. There is also a glossary of food labeling terms where the difference between terms such as “cage free” and “free range” is explained. Finally there is a glossary of gardening terms. The latter will be very useful for the new gardener. The book is beautifully produced and contains numerous exquisite ink and charcoal drawings by Waters’ longtime collaborator, artist and printmaker Patricia Curtan. This informative and beautiful book would make a special gift for someone who is contemplating growing their own produce, or for someone already engaged in gardening. Or better still, treat yourself.